The deep green powder is whisked to an equally emerald green frothy brew. Its aroma is sweet wildflower honey. 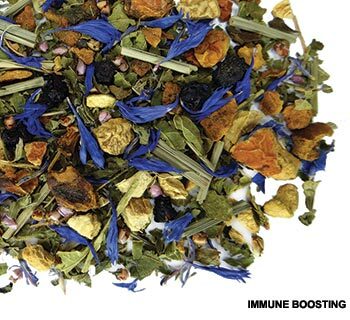 The infusion has an earthy, savory note, a balance of green alfalfa and cream. With the addition of natural white chocolate flavor, this matcha has a sweet taste that's enjoyable to those who don't usually like green tea. And, it is well-balanced so even the tea connoisseurs will enjoy this special tea. In the Japanese tea ceremony, simple sweets are served with matcha. This may include pressed wagashi (Japanese tea sweets) or mochi (a pounded rice cake) filled with sweet red bean paste. Check out your local Asian grocery store to see what tea sweets might appeal to you. Alternatively, a not-so-sweet gingersnap cookie or shortbread would be delicious with this matcha. 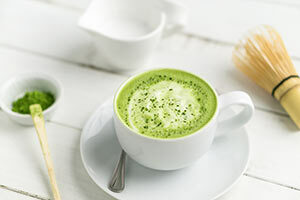 A nourishing frothy blend to enjoy year-round, matcha has become quite popular in the US in recent years. Since it is in powder form, it is an easy ingredient to add to a variety of recipes. It’s added to dark chocolate bars, French-style macarons, shortbread, cakes and even savory dishes. What will you add it to?